Home / Baby / Baby Products / Baby's Essentials / Featured Posts / Mother Sparsh / Wipes / Is It Safe to Use Wet Wipes During The Diaper Rash? Is It Safe to Use Wet Wipes During The Diaper Rash? As moms, we want the very best things for our babies. So before buying anything, we moms are doing a lot of research and then we take a decision. Nevertheless, we have to face many challenges. My baby girl had diaper rashes when she was only 15 days. That time was very challenging for me. I did not understand what would be best for her. At that time, I skipped to wear diapers and the most interesting thing, I started using Mother Sparsh wipes just a week ago. I used to be extremely lucky that these wipes were fully made with natural ingredients and more on. To be honest, once your baby has a diaper rash you would like to try everything for them in your power to clear it up quickly and with the least amount of discomfort possible. And trust me the right type of wipes can keep your little one’s skin clean without contributing to any skin irritation. If you can choose the right wipes for your baby then it will be absolutely safe to use during diaper rash. Buying wipes seem like an easy thing to do. But anyone who has ever walked through a local store knows how complicated things can get. There are so many choices available that it makes confused us. There are scented wipes, unscented ones, water-based wipes, thick wipes, and wipes for sensitive skin and much more. So you have to know what features to look for in baby wipes for diaper rash. Our baby’s skin is delicate. To avoid irritation, you have to choose a wipe that contains natural ingredients. Mother Sparsh 98% Water Wipes are free from all harmful chemicals like Alcohol & Parabens so safe for Newborns & Babies. It offers the perfect balance of natural ingredients and good cleaning power. When your baby has a diaper rash, you want to be cautious when cleaning their delicate skin. So go for a soft wipe that feels gentle on the skin. Mother Sparsh wipes are made with skin-friendly natural fabric which is super soft and they provide very safe and effective cleansing. The texture of the wipe is very soft and flexible. Are Mother Sparsh Wipes Worth Buying? Baby wipes should have a very good amount of moisture. Too dry wipes can make babies skin dry and that risk irritating the skin. 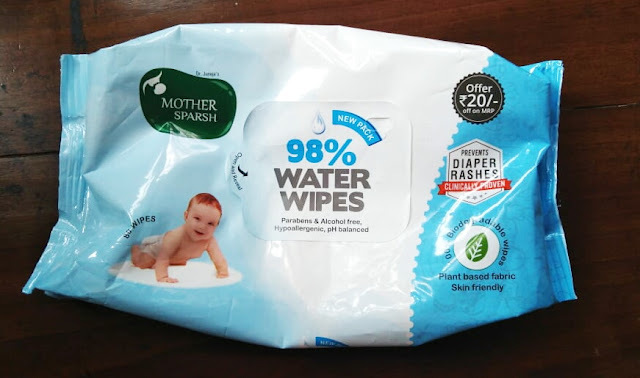 Mother Sparsh Baby Wipes contain 98% water which makes them as pure as Cotton & Water with natural aloe, and a touch of vitamin E which help to nourish and protect baby’s delicate skin without causing any redness, allergy or irritation even it is very safe to use if your newborn has diaper rashes (as per my experience). Mother Sparsh Baby Wipes are known for their purity. These wipes are free of dyes, parabens, phthalates, and synthetic fragrances. Mother Sparsh Baby Wipes offer many other benefits, making them an excellent choice for babies with diaper rash. The wipes are hypoallergenic, dermatologist-tested, and get their strength from Ayurveda. Now again I repeat my question, Is It Safe to Use Wet Wipes during the Diaper Rash? The answer is Yes, absolutely, wet wipes are safe during Diaper Rash but it must be equivalent to this Mother Sparsh Baby Wipes. Prasadhak - The Gift of Nature! get Herbal and Natural products online at affordable price.